Costa Rica is a peaceful oasis and a great place to learn and improve your Spanish while relaxing and having fun! Costa Rica is a small & fast developing and prosperous nation situated beside Panama in the southern part of the isthmus of Central America and can rightfully boast of outrageous natural beauty, warm and friendly people, and a clear pronunciation of Latin American spanish (as is exhibited with famous Costa Ricans such as Glenda Umaña who was one of CNN's top Spanish language news anchor in Atlanta, USA). 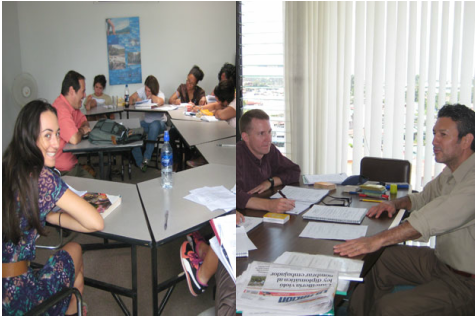 Learning Spanish while loving your time in Costa Rica is really an opportunity for you... if you take the step! Parklands personnel have worked extensively as language teachers themselves so we know what you are looking for, a genuine experience and good value with goals that can be accomplished. Our partner language schools and private tutors have an excellent standard of quality teaching and relationship with the learners (you). Allow Parklands to help arrange your stay and your studies. We are qualified to consult and help you find a great language learning opportunity tailored to your needs, as well as fantastic lodging and really fun one day or overnight tours. Parklands will handle every aspect of your stay, your studies and your fun, so you can just focus on learning and experiencing Costa Rica! Why not take the first step? Contact us now for honest sincere help!